Toyota is planning to manufacture key components for its hybrid cars outside Japan for the first time, in a bid to boost sales. It will start making parts at its research and development facility in China to cater for growing demand from the mainland. China is one of the world's biggest polluters but sales of hybrid vehicles are expected to grow steadily in the coming years. Toyota is the world's biggest carmaker. "Everybody recognises that China is going to be a very important market for all car manufacturers," Paul Nolsco, a spokesperson for Toyota, told the BBC. "Given the scale that we hope to achieve in China, it makes more financial sense to make these parts there," he added. The company said it is likely to manufacture electric motors and batteries at its Chinese facility, but a final decision was yet to be made. While boosting sales and capturing a larger share of the world's biggest car market is one of the main reasons behind Toyota's decision, analysts said other factors may have played a big role as well. China's restrictions on exports of rare earth elements is one of those factors. 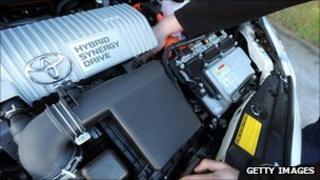 Some of the rare earth elements are key components hybrid car parts such as batteries. However, China, which produces more than 95% of the world's rare earth supplies, has imposed strict production and export quotas on these elements, citing environmental concerns. "Rare earths and concerns about their supplies could very well have played a role in this decision," Vivek Vaidya of Frost & Sullivan told the BBC. He explained that Toyota's move to start producing components in China may help counter these restrictions as it will be buying the elements to use within China. Toyota's operations were affected badly by the earthquake and tsunami that hit Japan earlier this year. Disruptions to the country's infrastructure and supply chain saw Toyota suspending or halting production not only at its Japanese factories but also at its overseas units. Analysts said the company is now trying to ensure that it diversifies its production to avoid any such issues in the future. "In case of any natural disasters, they want to ensure the supply chain remains de-risked and continued supplies are available to the factories," Mr Vaidya said. "You may see them doing this more and more, getting closer to their end markets and customers," he added. China was also the first country outside Japan where Toyota started to assemble and produce its Prius hybrid cars. However, the key components for those cars were manufactured in Toyota's Japanese factories and then sent over to the assembly lines in China. Analysts said that had pushed up sale prices in China. "That car basically flopped as the parts were too expensive," said Christopher Richter of CLSA Asia-Pacific Markets. The Chinese production of the Prius was eventually suspended by the company in April 2009. Mr Richter said Toyota's decision to shift the manufacturing of these parts to China would result in cheaper parts and eventually translate into better sales. "By making hybrids more affordable they can try and capture some of the market share and make this an attractive concept for consumers," he said.